Disneynature, inspired by Walt Disney’s True Life Adventure Films, began the series of films that has helped conservation efforts in 2007 with Earth. Now more than ten years later, just in time for Earth Day 2019 Penguins will be coming to theatres April 17th. I just attended a screening of Penguins on the Walt Disney Studios lot, as well as interviewed producer Roy Conli (Big Hero 6, Born in China). While I have enjoyed all of the Disneynature films, Penguins I think is their best one yet, and here’s why. Disneynature Penguins stays true to the traditional “True Life Adventures” that Walt Disney himself produced during his lifetime. I felt like the amazing cinematography paired with the natural comedic personality of the Adélie penguin, as well as the improv skills and comedic timing of narrator Ed Helms made Penguins the most true to the classic Disney nature films. While seeming the most true to Disney’s roots, it also felt very fresh. It had the perfect balance of fun, family, education, humor, nature, beauty, and drama (yet with a happy ending). Photo courtesy of Walt Disney Studios. The film takes place in Antarctica, where only two penguin species live (Emperor and Adélie). The Antarctic, being a place of great beauty yet somewhere most people could not travel to makes this film very intriguing. Seeing the vast planks of ice, the Northern Lights and winters the penguins in Antarctica have to endure really demonstrate how vast our earth is; and you can’t help but leave the movie in awe of the sweet yet brutal journey the 18 inch tall Adélie penguins take on year after year. PENGUINS – (Pictured) Ed Helms. Photo by Alberto Rodriguez for Disney. ©2019 Disney Enterprises, Inc. All Rights Reserved. Ed Helms embraces his role of narrating Steve’s actions perfectly, adding so much humor and energy into the film. The soundtrack also contributes to the tone of the film, with an instrumental score that’s very reminiscent of Soarin’ Over California, as well as 70’s and 80’s songs perfectly timed with climatic story arches (from great bands such as Whitesnakes). Disneynature “Penguins”. Photo courtesy of Walt Disney Studios. Penguins follows first time father Adélie penguin “Steve,” as he builds a nest, finds his lifetime mate, has his first two children, and teaches them how to navigate predators and getting out to open sea before the journey of that nesting season comes to an end. While many Disneynature films have followed the relationship between mother and child, this is the first time they’ve followed the journey of a father in the animal kingdom. The film is about 75 minutes long, making it the perfect length of a Disneynature film since it’s easy for kids to maintain their attention throughout the whole thing. I think the film is great for kids, except be aware that there is a scene that shows predators eating their live food, which is very quick but something to take note of depending on how sensitive your littles are. After the film, I had the pleasure of interviewing producer Roy Conli. He shared a bit about the amazing (yet brutal) journey it took to create this film. It took 3 years total to create, including a one year time span to just bring all of the equipment for the crew to the Antarctic, where journeys from New Zealand to the filming locations took about 10 days. The journey required ships that had to break through ice, helicopters, sleds, and hiking. The most difficult part of the journey was breaking through the thick ice of Drake’s Passage, which made up about 6 days of the 10 day total journey. Max Hug Williams (Principal Photography) surrounded by an Adelie penguin colony in an Antarctica snowstorm. The film crew camped a large portion of the filming time in tents, including Cape Crozier (the windiest place in the entire world) where winds got up to 150 mph. They also had journey a three hour hike in extreme cold from their campsite to the penguin colonies. Most of the film takes place in the penguin colony where they nest. And while we see very detailed shots, they were actually being shot with a very long telephoto lens, as to not disturb the Adélie penguins from protecting their eggs. The crew kept track of their star penguin “Steve” because penguins always return to their same nesting site, so they always knew where to expect him to return. Mark Smith (Principal Photography) filming Adelie penguins. It was fascinating to see the dedication from the crew, and how energetic and thrilled they were to be in such a cold, harsh place. You could tell from seeing snippets of them filming during the end credits that they were extremely passionate about capturing the life of the tiny but charismatic Adélies, as well as the awe they had of such a beautiful place that not many people will ever see. Because the experience of filming in the Antarctic was so unique and challenging, Conli shared that they have created a making-of Penguins which will be released in probably 6 months or so. 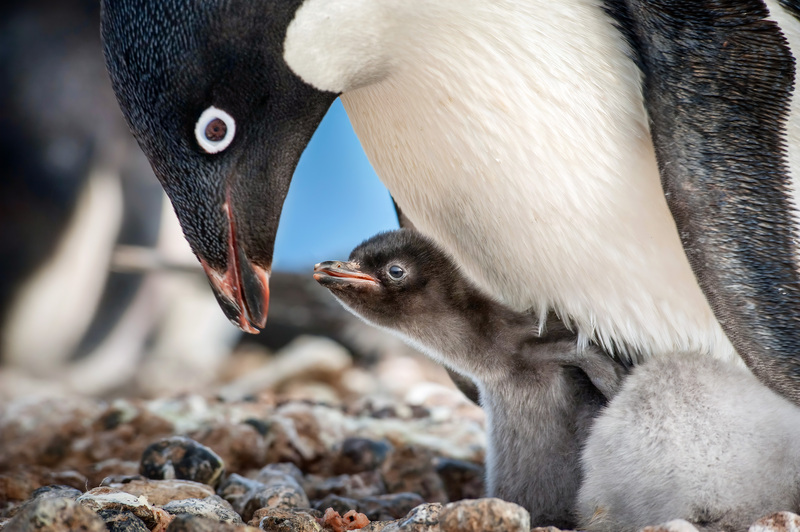 Disneynature Penguins will be released on April 17th in theatres, as well as IMAX. In fact, it is the first Disneynature film to be filmed in IMAX. If you purchase a ticket for a showing April 17-April 23rd in the US or Canada, a portion of the proceeds will go to the Wildlife Conservation Network through the Disney Conservation Fund to support penguin conservation. You can find tickets here. And to add to the Earth Day fun with your family, you can download the free Disneynature Penguins education and activity packet here. shopDisney Came Out With the Cutest Disney Eats Summer Collection! Things to Do in Wizarding World Including the New Dark Arts at Hogwarts Castle Show!